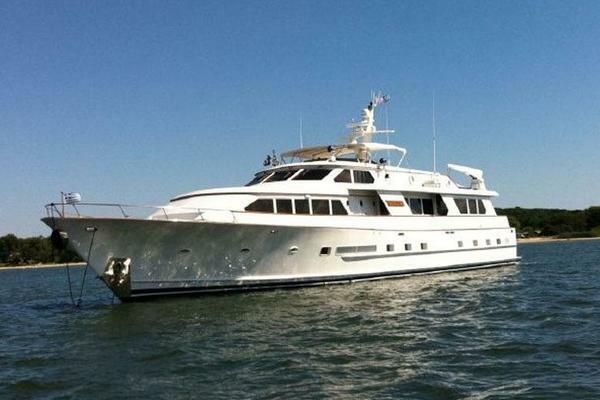 United Yacht Sales New Jersey would love to guide you through a personal showing of this 107' President Tri-deck 2008. This yacht for sale is located in Aventura, Florida and priced at $3,900,000. For a showing please contact us by filling out the form on this page and we will get back to you shortly! Sleeps 8 owners and guests inthree staterooms below with another master stateroom on the helm deck which can also be used as a skylounge. All have private baths. The crew are aft with two staterooms and two baths. A dayhead is found on the main deck level.Experienced yachtsmen (and yachtswomen) will find this good-looking and expansive 107’ tri-deck motoryacht quite intriguing. Her interior is completely paneled in satin-finished teakwood with gloss trim moldings.From the aft deck, enter the salon via stainless steel-framed glass doors (Aritex) which open in the center. A sofa pit is to port with a built-in entertainment credenza to starboard (pop-up lcd television). Just forward and to starboard is an L-shaped bar with stools. To port is a dining table which seats 8 in comfort. Next is a foyer with a dayhead on the inboard side and a country-style kitchen layout, with a large settee forward. Two sets of stairs to starboard lead down to the VIP forward (queen center-line bed, closet and bath).Two other full beam staterooms, fore and aft sharing a foyer area, are found aft down another set of stairs off of the galley area. The full-beam guest stateroom is forward with over-sized twin berths and luxury bath to port. The full-beam second master isaft and features a center-line king-sized bed, a spacious full beam bath with a shower and Jacuzzi tub, and a cedar-lined walk-in closet to port. Up another set of stairs on the starboard side by the main deck foyer is access to the wheelhouse. This expansive area offers an L-shaped settee to port, a wet bar aft and stbd, twin helm chairs and center-line helm area. Port and starboard wing-doors offer access to the walkaround Portuguese style bridge. Aft of the wheelhouse is a room which is currently designed as another master stateroom, complete with a center-line king-sized bed, vanities, entertainment system with a pop-up television , expansive windows offering great views, private bath and a private seating area outside. This area can easily be converted to a sky lounge area with a convertible sofa if so desired. From the aft main deck, a stairway to port accesses the second master stateroom (sky-lounge) deck. From there another stairway accesses an open flybridge with a helm station, wetbar, L-shaped settee, radar arch and boat deck. The transom area is reached via twin opposing stairways (euro transom) with access to the crew area through a watertight door . The crew area and engine room can also be conveniently accessed from the port side of the aft deck down a stairway.Crew accommodations feature a lounge/mess to starboard with a twin bunk stateroom with private bath to starboard and a captain cabin with a queen bed and private bath to port. Forward and to port is a foyer area and stairway leading to the aft deck through a watertight door. The President107' tri-deck sets the trend for larger yachts being built in Taiwan by virtue of her extremely high quality and craftsmanship. This 107' offers a 24' beam with walk around decks; giving her tremendous volume, with a 6' draft and lightweight construction - enabling her to cruise comfortably at displacement or planing speeds. The interior features gorgeous teak wood paneling throughout. Her versatilelayout provides for two master staterooms (one full beam below and one in a convertible sky lounge with a private deck), plus two other guest staterooms and crew quarters aft....making her an ideal yacht for dual owners or a large family. Also note the expansive aft deck, sky lounge deck and fly bridge area for entertaining. Sheis fully equipped with the most recognized machinery (including Tracstabilizers, Trac bow and stern thrusters,sewage treatment systemand CAT C32A 1800 hp engines all with low hours!). "D-Fence" is ready to cruise and US duty paid. Her good looks and spacious layout set a new standard for a tri-deckyacht which is easily managed and handled by an owner/operator with a short crew. Motivated Seller - Bring Offers!